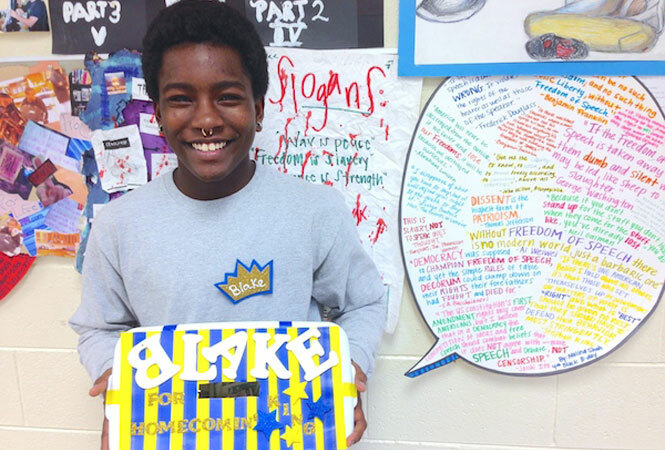 Blake Brockington, then a senior at East Mecklenburg High, holds the fundraising box that later determined his win as homecoming king in February 2014. CHARLOTTE, N.C. — Friends and community members on Tuesday mourned the passing of a Charlotte transgender youth activist, Blake Brockington, who died as the result of suicide overnight. 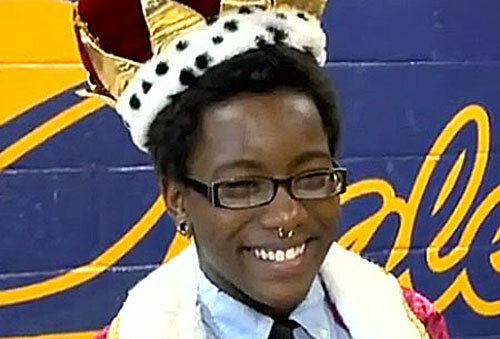 Brockington, 18, was a 2014 graduate of East Mecklenburg High School where, last year, he was nominated and later crowned homecoming king as an openly transgender student after winning a fundraising competition and drawing in $2,335.55 for a charity chosen by the school. Brockington’s homecoming win is believed to be the first for an openly transgender student in Charlotte. Details of Brockington’s passing and any plans for memorials are not yet known. qnotes will provide updates as they become available. Brockington’s death was confirmed and announced publicly Tuesday morning by Time Out Youth Center, a local LGBT youth services agency where Brockington received support. Brockington’s death is the second such local incident in recent weeks. In the year since his homecoming win and graduation, Brockington became an outspoken advocate, speaking at last year’s Transgender Day of Remembrance event and organizing public rallies and other grassroots campaigns to raise awareness on police brutality and violence. In one action in December, Brockington led activists in a brief shut down of Independence Square at Trade & Tryon Sts., followed by an impromptu march through Uptown. He and other activists also planned and coordinated a similar action at SouthPark Mall during the Christmas shopping season. Brockington, who came out as transgender in his sophomore year of high school, was active in East Meck’s band where he served as drum major for two years. He also played on a student club rugby team.